On the way to Anza Borrego last month my family and I found ourselves traversing the back roads of North San Diego County for the first time. It’s really quite picturesque with rolling hills dotted with ranches and farms. We even came upon a pack of wild turkeys! When in the Warner Springs area we discovered one of our favorite road trip sights – the historical marker. A few hours later on our way home we decided to follow up and see what the sign was as about. 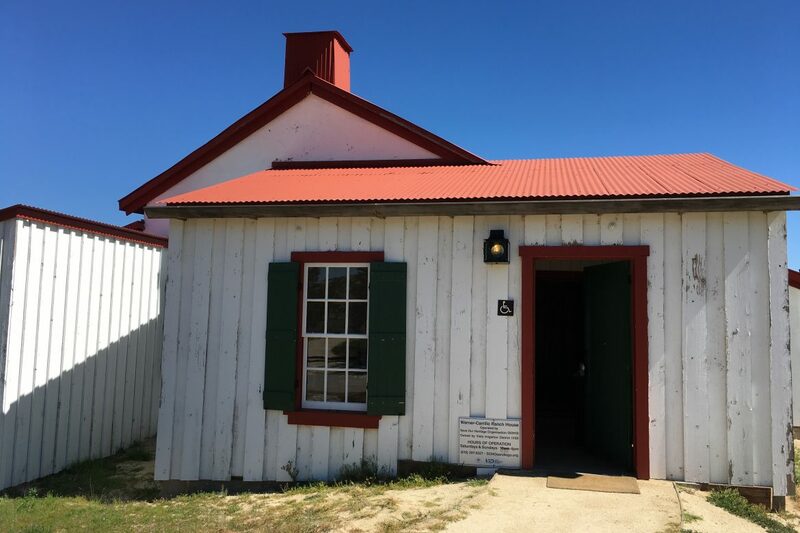 The Warner-Carrillo Ranch house dates to 1857 and was built by Doña Vicenta Carrillo, a prominent female rancher and ancestor to Hollywood actor Leo Carrillo. Aside from serving as the family home it at one time was a stop on the Butterfield Stage Route. As happens to several historic structures the ranch house has had its ups and downs throughout its existence. During the 1930’s the house was occupied by cowboys who were working on the surrounding ranch land. Hollywood notables such as Will Rogers and John Wayne would come visit them and get a taste of the “old west.” In 1960 it was abandoned and by 2010 it had fallen into such a state of disrepair that a complete restoration was necessary. A National Historic Landmark, it reopened in 2013 amid much celebration. On our visit the structure looked beautiful with the interiors decorated to evoke the era of Doña Carrillo. We met with a friendly docent who told us all about the history of the structure and its surrounding land. Clearly passionate about Southern California history his enthusiasm was infectious and we all found ourselves enthralled by the property. The Warner-Carrillo ranch is a significant part of California history and is sitting there in Warner Springs ready for visitors. It’s off the beaten path which makes its restoration and continued care a wonderful preservation story. It’s definitely worth seeking out and I’m so glad my family and I decided to stop and visit. Always stop for a historical marker. You just never know what treasure it will lead to.